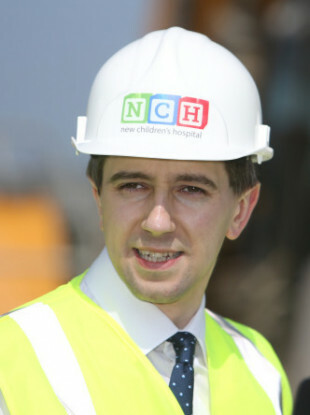 Simon Harris at the National Children's Hospital site in 2017. HEALTH MINISTER SIMON Harris plans to apologise to the Dáil over information he provided regarding the cost of the new National Children’s Hospital. Harris came under fire last week after it emerged he was informed in August that the budget for the hospital could overrun by €391 million. Fianna Fáil and Sinn Féin have also criticised the fact that Taoiseach Leo Varadkar and Finance and Public Expenditure Minister Paschal Donohoe were not informed about the potential overrun until 9 November. Sinn Féin today denied trying to use the issue to trigger a general election, as suggested by Fianna Fáil. Harris has been under mounting pressure in recent weeks due to the issue as well as the ongoing nurses and midwives’ strike. Earlier today, a group of protesters gathered outside his home in Co Wicklow before leaving the scene peacefully when gardaí arrived. Speaking on RTÉ’s Prime Time on Thursday, Harris denied that, if disclosed earlier, the potential overrun would have had an impact on Budget 2019 as the capital budget was already agreed in February 2018. Varadkar said he has “total confidence” in Harris. The Oireachtas Public Accounts Committee recently heard the total cost of the project is “highly unlikely” to come in under €2 billion. A figure of €983 million for the development was approved by the government in 2017. Today a spokesperson for Harris confirmed the minister would apologise to the Dáil this week over the information he provided. They told RTÉ’s This Week: “While the minister couldn’t provide figures during commercially sensitive negotiations and because the figures were not known, he has said he wishes he had inserted some initial information – specifically reference the fact that there was a process underway to finalise pricing for Phase B (of the Children’s Hospital). Sinn Féin believes Harris’ position is untenable and said it would put forward a motion of no confidence in the minister if Fianna Fáil, which supports the Fine Gael-led minority government through a confidence and supply agreement, would back it. Fianna Fáil has criticised Harris’ handling of the issue but stopped short of calling on him to step down. Speaking on This Week, the party’s health spokesperson Stephen Donnelly said Fianna Fáil would not bring down the government over the issue. He said supporting a no-confidence motion in Harris could lead to a general election – an undesirable situation 48 days out from Brexit. Donnelly called on Harris to make “a full and frank apology”, not “a mealy-mouthed statement” where he denies withholding information from the Dáil. “The Dáil record matters … he must accept that he misled the Dáil and correct the Dáil record,” Donnelly said. Donnelly said upwards of €1.7 billion is “not an acceptable price” for construction of the new hospital, adding there is “a very small window of opportunity to get costs down”. In a statement, Sinn Féin’s health spokesperson Louise O’Reilly said Harris’s apology is “nothing more than political cover for Fianna Fáil”. “Let’s be clear here, Sinn Féin is not seeking an election. We are simply seeking the removal of this incompetent minister who is charged with managing a budget of over €17 billion. “The announcement that Minister Harris is to apologise to the Dáil this week is clearly nothing more than political cover for Fianna Fáil in return for their protection of Minister Harris. It’s a cosy little deal between the two government parties,” O’Reilly said. Are apologies now to replace political accountability? How many more apologies is the minister going to issue? Helen McEntee, Minister of State for European Affairs, told This Week she doesn’t believe Harris misled the Dáil, saying the cost of the overrun wasn’t confirmed and no minister would give the Dáil “partial information”. She said the cost of building the children’s hospital was always going to increase but that such a significant overrun was not anticipated. “I don’t think anybody is happy with the costs we’re seeing,” she said, noting that consultants PwC are looking into how costs spiralled. Email “Harris to apologise over children's hospital overrun as Sinn Féin denies wanting to trigger election”. Feedback on “Harris to apologise over children's hospital overrun as Sinn Féin denies wanting to trigger election”.